Introducing the Vesta H2 Water Ionizer. Our best ever water ionization and filter machine. With a dual filter system that can be customized for your location’s unique water conditions. The market focus for alkaline water ionizers is now on hydrogen performance. The water cell – the engine of the ionizer – has two components: electrodes and (ion exchange) membranes. Ionizer performance used to be entirely focused on pH/ORP and the electrodes. H2 Infusion Technology is based on the fact that membranes are as critical as the electrodes. The Vesta H2’s 13 stages of cutting-edge filtration give you healthy water that is pristine clean! The Vesta H2 gives you an ideal balance between of seven highly engineered SmartDesign Electrodes, the right amount of power to run them, a great flow rate and solid performance. H2 performance at lower, drinkable levels of pH that taste great! The Vesta H2 is better than other systems at delivering H2 performance, especially at lower more drinkable – and safer – pH levels. Fully automatic DARC Cleaning System. Clean with every use. Keeping your plates clean is essential to getting great H2 performance. We pioneered lasting performance with our DARC cleaning. Ultimate insurance! The Vesta H2’s Real-time Flow Control System provides you precise control of your flow rate – each and every time you use it. With AutoAdjust the power can be adjusted to the optimal level for your water ensuring you get peak H2 performance each and every time you use your Athena H2. Why the 9-plate Vesta H2 is your absolute first choice for the cleanest, healthiest, best-tasting, hydrogen-rich water. Most alkaline water drinkers naturally gravitate toward drinking water that is somewhere between pH 8 to pH 9 for the simple reason it tastes better than high pH water. It is safer too. This poses a problem. You end up drinking water at a low pH that tastes good but doesn’t have beneficial levels of H2. Or to get good H2, you have to drink water with pH 10 or higher, which isn’t palatable – or safe. Something has to give; you can’t get both. That is until now. The Vesta H2 Water Ionizer outperforms other ionizers in H2 and does so in a safe and great tasting pH 8 to 9 range. That gives you the best of both worlds. The Vesta H2 offers you an industry-best water filtration system, the latest features and finest on-demand Hydrogen generation technology you can buy. It is the zenith of our new H2 Series. The result is you get the safest, cleanest, healthiest – and very importantly – best tasting water. Industry best 13-stage dual-filtration system and UltraWater. Don’t buy an expensive single filter system or one with cheap Vitamin C or carbon filters. The Vesta H2 offers you our UltraWater Technology plus 13 stages of cutting-edge filtration to give you the healthiest water that is pristine and ultra-clean! Nine advanced SmartDesign Electrodes. We do not believe in over-sized or over-powered electrodes, which are often a sign of inefficient design. They degrade faster and have a questionable effect on performance. Other ionizers with nine or more electrodes require A LOT of power to run them. Some even have to slow the flow rate. Our engineers found that you get the best performance when you have a highly engineered electrode design matched with proper power density. Our SmartDesign Electrodes are engineered to deliver maximum efficiency. The Vesta H2 Water Ionizer offers you the perfect combination of electrode design and count and the optimal power to run them. The result is a great flow rate, top performance, absolute reliability and lasting durability. Top H2 performance at lower, drinkable levels of pH that taste great! Most other systems can create at least a low level of H2. However, any system that creates decent H2 has to run at a maximum setting and produce water above 10 pH to achieve that result. Not only is it questionable in health terms, but water that high in pH tastes bad! It also it stresses the electrodes. The Vesta H2 is better than other systems at delivering H2 performance, especially at lower more drinkable – and safer – pH levels. We can’t stress this point enough. Cleaner, healthier and better-tasting water. Step up! Fully automatic DARC Cleaning System. Clean with every use. We pioneered DARC cleaning. This is simply the best way to help ensure that the most critical component of the ionizer – the electrodes – stays free of scale buildup. Scaling is the enemy of performance. The Vesta H2 Water Ionizer continues our tradition of offering the best cleaning system so you get great performance, especially over time. It also gives you the peace of mind of never having to think about cleaning or waiting for a cleaning cycle to complete. The Vesta H2 for the best performance and ultimate convenience! Real-time Flow Control System. The optimal flow rate is also critical in achieving optimal hydrogen performance. The Vesta water ionizer’s Real-time Flow Control System provides you an LCD display and a selectable valve that allows you to set easy and precise control of your flow rate – each time you use it. Top Certifications. The Vesta H2 is manufactured by AlkaViva. The world’s leading water ionization company for over 20 years. For complete details, see the full Vesta H2 Owner’s Manual in pdf format. 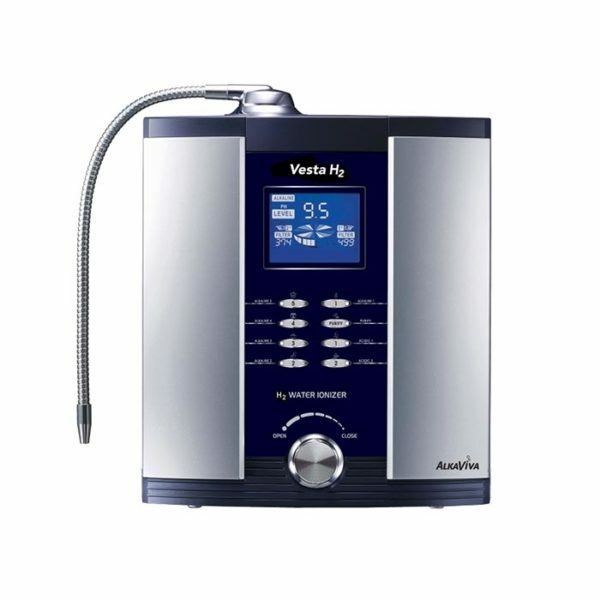 Call one of our water experts to find out all the benefits of a Vesta H2 Water Ionizer.